Stranded in the countryside and confronted with a live chicken which he has to roast, Withnail is paralysed. ‘ I think you should strangle it instantly,’ says his anxious friend Peter, ‘in case it starts trying to make friends with us.’ ‘I can’t,’ he adds, ‘those dreadful, beady eyes’. Any book beginning with allusions to Withnail and I is bound to catch my attention, but one focused on vegetarianism has little chance of holding it. Tristram Stuart has succeeded where many others have failed, and has managed to make this burger-lover consider my relationship with food; he has also enthralled me with a history of a movement that has carried some of the greatest minds of the 17th, 18th, and 19th centuries along with it. In short, I enjoyed this book. The history of the vegetarian movement is fascinating. European interest in the vegetarianism originated from contact with India in the 17th century. Society’s collective consciousness was pricked. Franklin, Rousseau, Voltaire, and Shelley all became involved in the debate about man relationship to animals. There were, broadly, three phases of vegetarianism in the period he scrutinises. In 17th-century England, eschewing meat was a means of religious dissent by those who saw the church as corrupt. It was an attempt to purify religion. Isaac Newton, who tried to prove the unity of all religions, viewed ‘being merciful to all animals’ as one of the cross-cultural ethical imperatives. The final phase is revolutionary and climaxes with the French Revolution. Meat signified social inequality – only the rich could afford it – as more and more land was enclosed for pasture so the privileged could indulge themselves. Seditious circles in Paris and London were crammed with vegetarians. Underlying it all, philosophers and scientists, savants and rabble-rousers searched for the perfect religion, health and society. 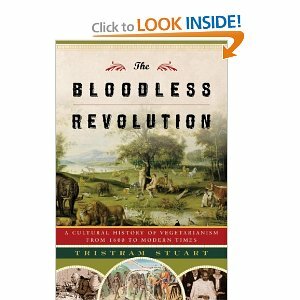 Stuart has the capacity to be informative and passionate, without being preachy, and coupled with an engaging narrative style achieves a fine debut with this book.His fundamental thesis is to demonstrate that the study of attitudes towards food is the gateway to appreciating how people understood their place in society, their relationship to their environment and the significance of being human. Whether you are a carnivore or a herbivore, get your teeth stuck into this soon! “Whether you are a carnivore or a herbivore, get your teeth stuck into this soon” . Haha that’s funny. Im an omnivore though, still you make it sound interesting and I would read it but I wouldn’t buy it. Glad to hear I made it sound interesting at least! Yeah, I never really got the vegetarian thing, but at least I kind of understand it now. I probably should apologise for the cheesy omnivore/herbivore line though. I won’t though. Ha never apologise for anything unless your solicitor tells you too.